Hey guys! 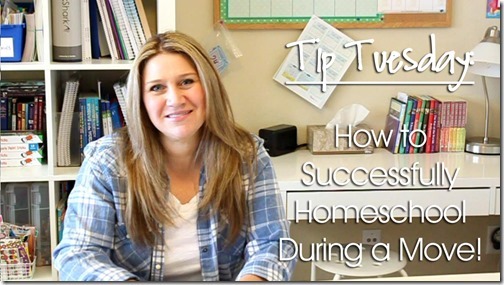 I’ve had a lot of requests to share my secrets to homeschooling during a move. Most of you know that we moved a couple of years ago during our homeschooling year, and I’m not gonna’ lie, it wasn’t easy! But with a little bit of organization and preparation moving during your homeschooling year isn’t as overwhelming. I also have to thank all of the friends and family who helped us move and get settled in because without them it wouldn’t have been possible. And we managed to get through it relatively unscathed, started school a week after our move, and haven’t looked back since! So today I’m sharing what I learned about that experience. Hopefully these tips will help you out too! 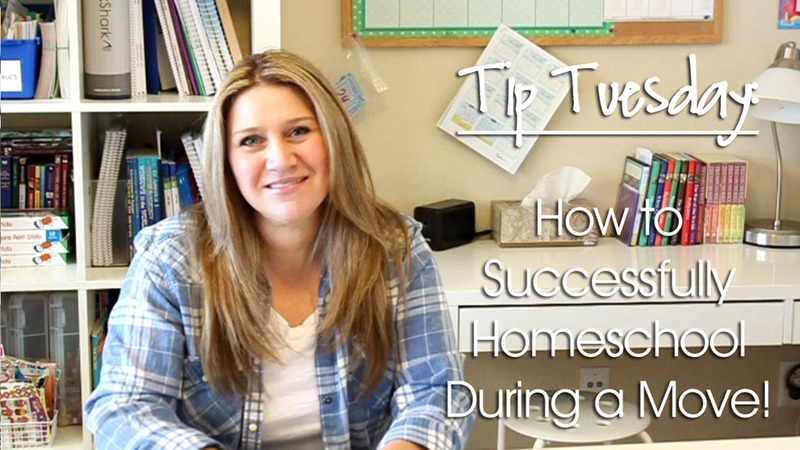 Watch my tips for successfully homeschooling during a move here! Have an idea for a Tip Tuesday video? Make sure to leave a comment below! thanks so much for this timely tip tuesday, having found out on Friday we are moving in two weeks time. We are about to prepare our house for sale. As a homeschool mom do you have any tips for this? As far as meals, keeping tidy with everyone at home for showings, scheduling your day, or anything else you wish you would’ve done? We tried several things like pre-made dinners etc. Unfortunately most people wanted to see our home during dinner time which meant we had to either eat out or bring a picnic somewhere. We did a combo of both. Also, I didn’t want to have a big meal going then get a call for a showing and have to clean up a huge mess. So we stuck to easy quick meals during that time. The other thing we did was pack up a bunch of things we didn’t really need out which helped our home be less cluttered. And it also made it easier to clean in a hurry. Everyone had a job, so if we got a call for a showing we all knew what to do to get it cleaned and out of the house quickly! That is so helpful! I do not have any family in state to help me during this as I approach this with 5 boys, ages 10 and under. Any other wisdom you can foresee I’ll need? I’m thinking of throwing all clutter into boxes to prepare for showings then going through those boxes and decluttering all after our home is under contract when pressure is off. Is this a bad plan? Yes, we use clipboards too! And I like the expanding folder idea as well! We are right in the middle of all this. We have been off for 3 weeks! YUCK! We have been in the house for 11 years so we have had to take time to paint, clean, repair and get ready for sale. Our house went on market last week and PTL we already have a contract! Keeping it clean behind the kids was stressful but they understood why. They even did chores happily to help out. I did what you did. I put ALL our current, basic school work in a tub and kept it out. Everything else has been packed up. We are building a house so we have to stay in an apartment temp. while it gets finished because our buyers need us out by APril 1. I will easily be able to take our big school tub around with us. I had a school room just like yours but our new house will be smaller and no school room. I am going to have to get creative with space and no more big white table. 🙁 I will have to take it apart, in half, and give the kids each one in their rooms. Great tips!!! We moved a few year ago in at the end of September. I did take a week off before the move and then it ended up being about 2 weeks after the move (we had a 1 week gap time from the sale of our house and when we could get into our new one). I think I followed all of those tips!! Great minds think alike! 🙂 Another tip I would add is that I used the moving time to clean out my school room! I got rid of a whole bunch of stuff, less to move and less to unpack. I am loving these Tip Tuesday videos thanks so much! Your ideas are great! Thanks!!! For the weeks during house showing & around the move-we got paper plates, cups, and bowls. Save time washing & packing in the kitchen. You can even pack your dishes first. Exchanging flatware for plastic is not as helpful, Just use it, throw your flatware drawer in a box at the last minute.